Holy crap people!! This is the cutest thing i've made since my children! I love it! I still don't really understand the need for it, but it's adorable. I rarely use pins and when i do they're kept in a bowl until i need them, at which point they move to my mouth. Which i probably should stop doing, i'm constantly telling Sammy not to put things in his mouth so i guess i should follow my own rules as well eh?! 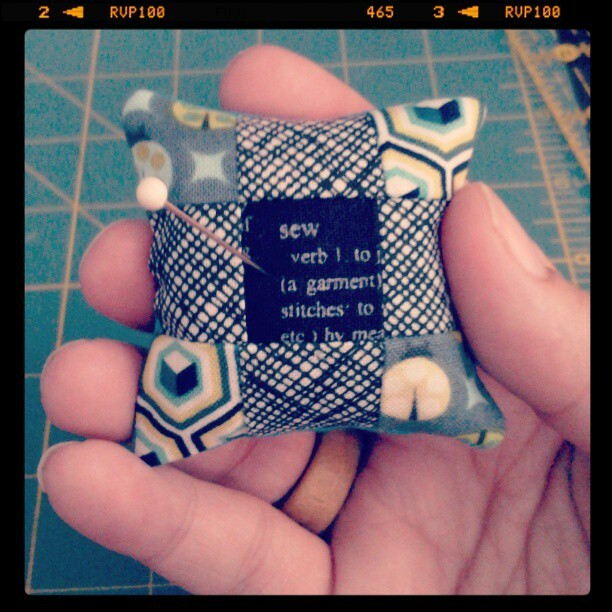 So while i'm not sure i will use it, it's cute and will live happily in my Sew and Go Organizer. Which has only gotten this far since Wednesday. (due to some unforeseen events, yesterday was a total write-off for sewing.) I just need to make one more pocket, find some wool felt for my needle book, get some heavy interfacing, attach the front and bind! The first was in the construction of the pockets. The instructions say to cut two pieces of your chosen fabric for each pocket and iron on fusible interfacing... Well, i didn't have any interfacing, so i left it out and it seemed a bit silly to use "good" fabric for the inside of a pocket that you would never see. So i cut one of all my pockets in my chosen prints and lined them all in a solid teal that matches the teal in the Meteor Shower print by Tula Pink from her Birds and the Bees line. 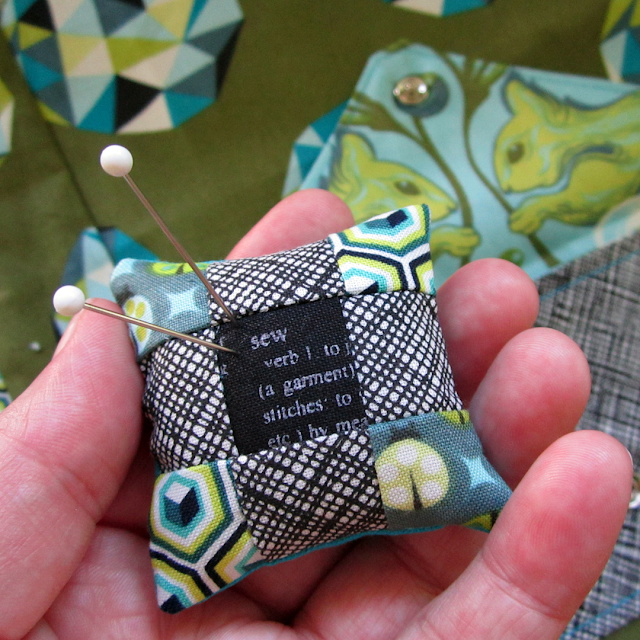 The only pocket i did use "good" fabric inside and out was the little envelope pillow. It was begging for some fussy cut love! I also changed up one of the pockets on the left hand side, in the original organizer the smaller pocket angles off at the right. It seemed a bit of a waste to me so i made it the full width of the of the organizer. The scissor pocket stayed the same with one little change. 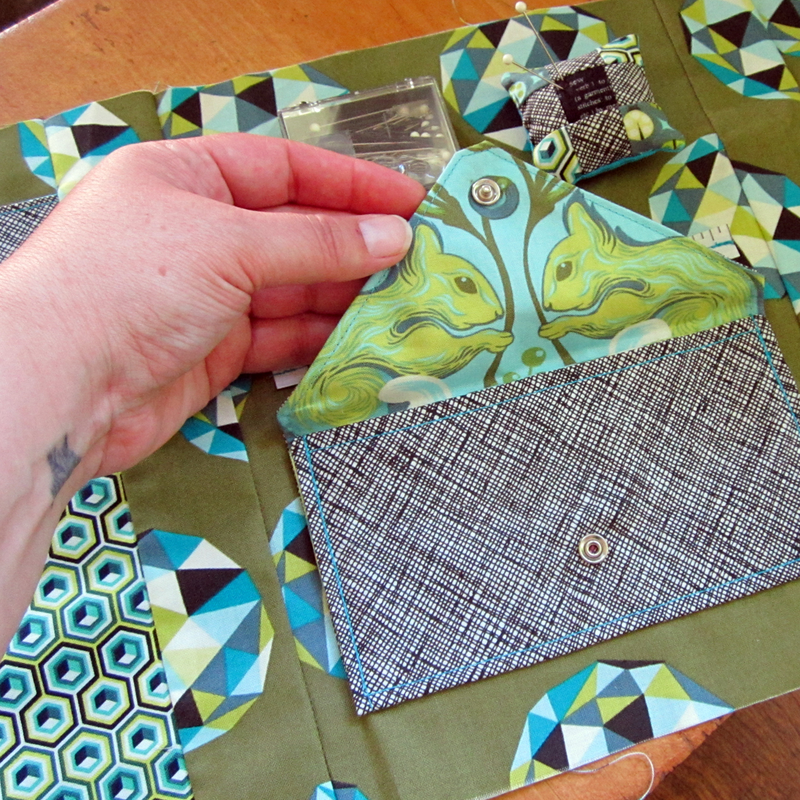 In the original, Alexia Abegg used a piece of ribbon to tie the scissors in, i opted for a little snap on a piece of the Hex Box print from Tula Pink's Prince Charming line. Easier than fiddling with a bit of ribbon to tie them in! 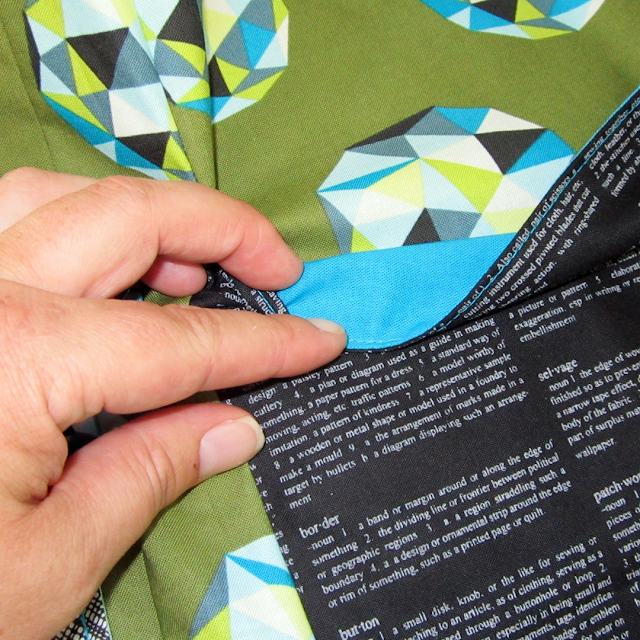 I love the fussy cut scissor print, it's the same sewing definitions fabric i used for the right hand side pocket,the print is called Sewing Guide and it's from Moda's Mama Said Sew collection. I think i may need to buy a lot more of it!! So my next pocket is for above the piece of measuring tape and beside the little pincushion. This is originally where the needle book was to go, but i'll be moving that to beside the scissor pocket. I keep bobby pins (for holding hexies together while sewing), bobbin spools (i don't carry spools of thread, i just wind a couple bobbins in the colours i need. usually one for basting and another couple in my stitch colour), and i've now added some pins... not sure if i will use them, put i need something to stab into the pincushion right?! I have a couple more things to make, i'm thinking some simple flat zip pouches to slide in the two big pockets at either end, and i may need to make an open wide zip pouch out of that Squirrel print, you know, to hold extra things! 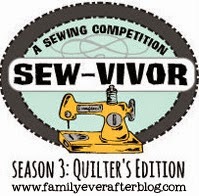 Linking up for Finish it up Friday and Needle and Thread Thursday!! Love this organizer with the stinkin' cute pincushion! I too was doubtfull about the pincushion craze, until of course I made some. I am like you, I never use the darn things, but they are just adorable sitting there next to my machine. Loving all of your fussy cuts, I want to eat those darn squirrels. Never mind. People actually do that, now I feel like a terrible redneck. What I am trying to say is that I think they are cute. Oh god, lame! just going to shut up now. Great organizer! Love the fabrics; especially those fussy cut squirrels! Super cute pincushion! Ummm... and that squirrel pocket?!?! Seriously. love. I am loving your organizer! !my favorite part, of course, is the secret squirrel pocket. Thanks for the great tip on using bobbins to carry thread, that is definitely a space saver!! If I didn't have such a cute strawberry travel sewing kit I would be making a new one like yours! 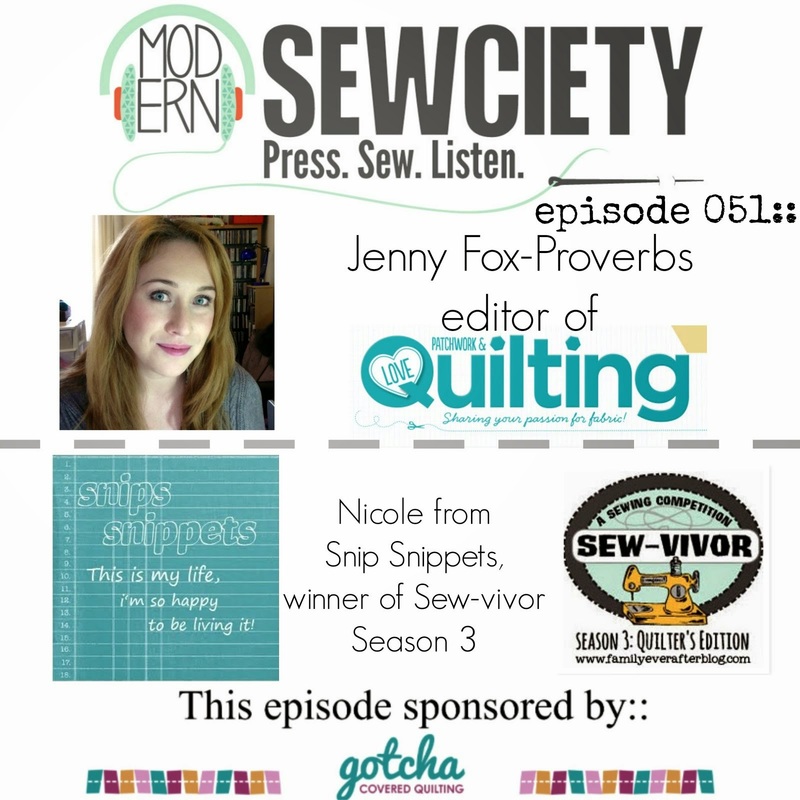 I'm so glad you shared this at Needle and Thread Thursday! Thanks for linking up! Love the squirrels. I think the attraction to pincushions is that feeling of accomplishment and of working with such small pieces of fabric. I know I can use 1 inch squares to make a pincushion but try never to use fabric smaller than 2 1/2 inches for quiling. SO cute! That organizer is awesome. Oh my goodness, that is one fantastic project. Love your fabric choice and this whole thing! Plus I had to laught about the pincushion story. Funny. You're hilarious! I love the secret squirrels! In fact I can't wait to see the finished product, you're putting so much thought into it! Also I can't get over how great that aqua blue solid goes with the Tula Pink fabrics. The whole thing has made me smile :) Thanks! The organiser looks fabs! I'm with Gina - loving the secret squirrels pocket! Gotta be honest, I didn't get the huge thing about pincushions at first either, but I kinda do now though don't have a crazy collection or antyhing! ;) Just one fave that is in daily use! Hahahaha! This calls to mind a quote my husband sent to me earlier today -- "Minds are like parachutes. They only function when they are open." So glad your openmindedness yielded such a freaking adorable little pin cushion ;). And that organizer looks great! This is lovely and will be so useful. I love your use of fabric, and the secret squirrels are adorable. What an excellent organiser. The scissor snap was a brilliant idea. I've never seen an organizer like that! I love it - superb fabric choices too. That crosshatch is one of my favorites :D I don't use pins/pincushions that much either but for some reason I'm dying to make like a dozen different pincushions. Maybe I'll call them mini pillows and put them in windowsills so I can just stare at them. Love the Sew and go organizer. Like it way better than mine. Did you have a pattern or just make it up along the way. Love the little snap to hold the little scissors down. Mine became a very snug fit once I got the cutting mat in it's pocket. Glad I stopped by via My Quilt Infatuation.